My uncle makes this at our family reunions and it is sooo goood. He barely gets it off the stove before it is gone. My version is slightly different as I apply my interpretation and tastes. Such as I use fresh corn on the cob or left over corn on the cob. He uses canned whole kernel corn. And I am guessing on the sauce. No matter how you go, it is all good and trust me – you won’t have left overs. This is best made in a cast iron pan. I used a 12 inch pan. If you don’t have one, go out and get one. They are not expensive at all and will last forever. You can check out my entry discussing different types of pans here. Total cooking time is about 45 – 60 minutes. 1 tsp Mirin (rice wine) – or use Sherry or Masala cooking wine. In the cast iron pan over med heat, cook the bacon until almost crisp. Remove the bacon with a slotted spoon and drain on paper towels. While the bacon is cooking, whisk all the sauce ingredients together until the sugar is dissolved. Set aside until ready. Drain all but 1.5 TBs of the rendered bacon fat into a glass container. Add 1 TBS of butter to the pan and heat until melted over med-high heat. Add diced onions and a few grinds of fresh pepper and a pinch of salt. Toss the onions and cook, stirring occasionally until they begin to caramelize ( about 7 minutes). Add in the garlic and bell pepper if using. Saute for about 1 minute. Add in the corn, bacon and stir. Let sit for about 2 – 3 minutes in between stirring. After about 10 minutes, add in 1 TBS of the sauce. Stir and continue to let cook over med-high heat to allow the sugars in the sauce and corn to release and caramelize. Stir every 1 – 2 minutes. Taste after about 4 minutes. If you need more sauce, add a tsp at a time. You don’t want too much. Just enough to enhance the flavor and create a nice glaze on the corn. Let it start to caramelize on the bottom of the pan before deciding to add more. You will need to cook another 10 minutes or so.. Lower the heat to med if you feel it is getting to hot or starting to burn. 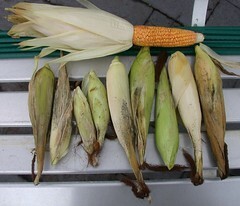 It is done when the corn starts to turn a light brown and shrivel slightly (meaning the juices are escaping the corn). Caution on salt as the sauce has salt. Always taste before adding salt after step 4. I like the corn a little on the juicy side, so I stop a little earlier than others. But like I said, it is all good. Enjoy! I guarantee you the kids will love it! NOTE: To make this vegetarian – just use butter and omit the bacon and bacon fat. Posted by culinaryease on May 25, 2011 in Cooking for two or less, General Cooking, Recipes, Side Dish, Vegan/Vegetarian and tagged Bacon, Corn, PostaWeek2011, Squaw corn.